Your outdoor sanctuary already has ample lighting to keep the night going. But once the sun goes down, Long Island nights can become quite chilly. Sometimes, to keep the party going, you need more than great conversation. With outdoor fire features by Topaz Design Group, guests will remain cozy and entertained for hours. A good fire is naturally intriguing, especially when it’s incorporated into a gorgeous outdoor living space, such as your outdoor kitchen. Whether guests want to lose themselves in the beauty of the flames or cook marshmallows for a nighttime snack, an outdoor fireplace or fire pit offers something for everyone. It can set the scene, provide a stunning natural backdrop for conversation, and give your yard a rustic, elegant touch. At Topaz Design, we spark your creativity and kindle your dreams of the perfect outdoor fireplace or fire pit. From natural stone to brick veneer, our team incorporates your personal taste to design a masterpiece. Our outdoor fire features are strategically placed within your yard to ensure that they will never pose a safety hazard. Even more, the Topaz experts work with you every step of the way to ensure that you can light up your landscape. Designing these outdoor wonders for many years, we have seen firsthand the extraordinary impact that they have on homescapes. And so, with our service, we want all homeowners to have the chance to delight in their very own outdoor fire feature. 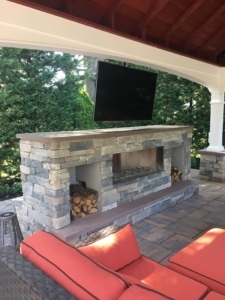 To experience firsthand all that an outdoor fire feature can do for your home, complete our online form.